2 Pcs. 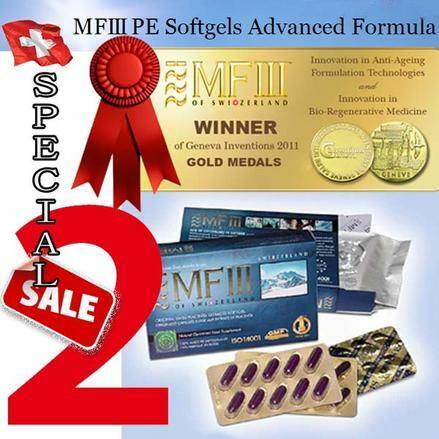 MFIII PE SoftGels Plus Advanced Formula 60Caps. The ultimate lasting solution to your well being . of Switzerland has a long standing history in specialised Research & Development of cellular and placental-based nutritional supplements. Combining over 80 years of top-level strategy experiences with specialised knowledge in cellular therapy, delivers the ultimate lasting solution to your well being – PE Softgels Advanced Formula, total regeneration from within. proprietary cold-extraction Celuxinis™ Proteolytic Enzyme was uniquely developed by our scientists to extract the fresh PE in its purest form while maintaining its highly concentrated and potent bioactive ovine cellular extracts. No heat application were utilised throughout the process of extraction. To date, of Switzerland is the only supplier of Swiss manufactured Placental Cellular Extracts in unrivalled hi-tech softgels. PE of Switzerland is NOT a drug as it contains no chemicals but only natural ingredients of the highest quality. PE Advanced Formula enhances and invigorates our bodies with a wide range of health benefits. Certified by high quality standards of ISO 14001, TQM (Total Quality Management), HACCP and FDA compliance. HALAL certified, SCES and SIS. Met specific requirements of Qualified Responsible Chemists, Pharmacists, Toxicologists and Quality Controllers. GLP (Good Laboratories Practice conditions) and Bio-HC clinically tested. Complied fully with the requirements of EC –cGMP (Current Good Manufacturing Practice), the highest GMP status in manufacturing.